In the last edition of Spot the Error, I noted that there was an UER on both the ERR and COR versions of this card. To the extent of my knowledge, this UER has never been officially recognized by any of the trade guides, catalogs, databases, etc. In fact, I didn't even recognize this UER until I was researching the Spot the Error post. 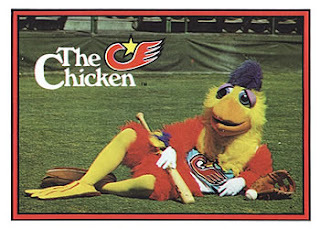 Joe Average Card Collector, HH99 and BrerSkwerl all gave it a valiant effort, but none of them found this elusive UER. So, whoever finds this UER will get two points in the Spot the Error competition, AND a copy of this card. Woot! I mean, Hoot! Wait, I mean Cluck! Is it the lack of the trademark symbol on the card to the right? 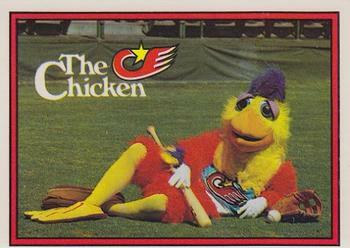 Cuz otherwise, the only error is that the Chicken got a card. 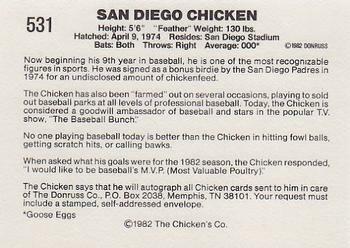 Hatched in March of 1974, instead of April 1974? 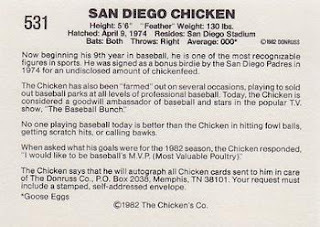 Johnny Bench was the star of "The Baseball Bunch", not the chicken. The average is listed as .000, yet the bio says he's good at getting scratch hits.